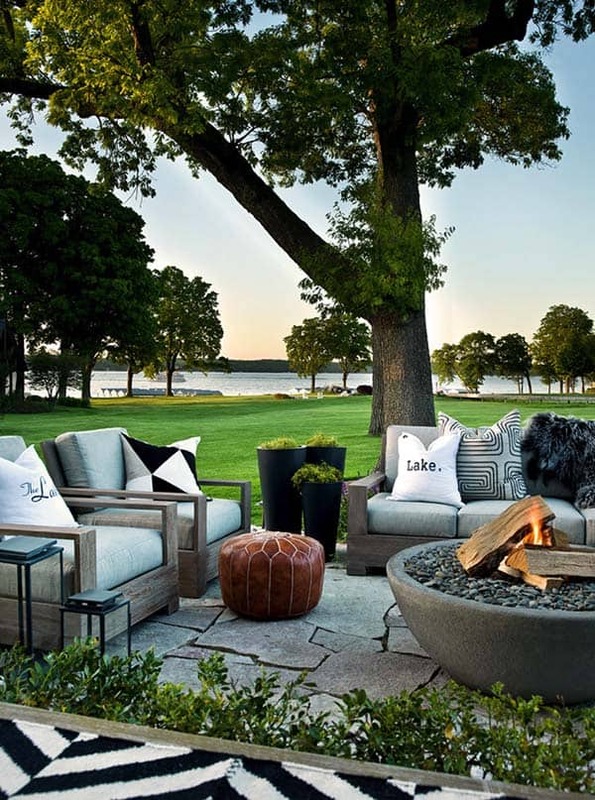 Outdoor fire pits make a great design feature to your backyard escape, perfect for entertaining and creating an inviting ambiance to a crisp evening. Its wonderful to just sit around and stare at a burning fire, plus you can enjoy cooking marshmallows and making s’mores as an added bonus. Not to mention, you can have the enjoyment of one in your backyard for a lot less than you think. 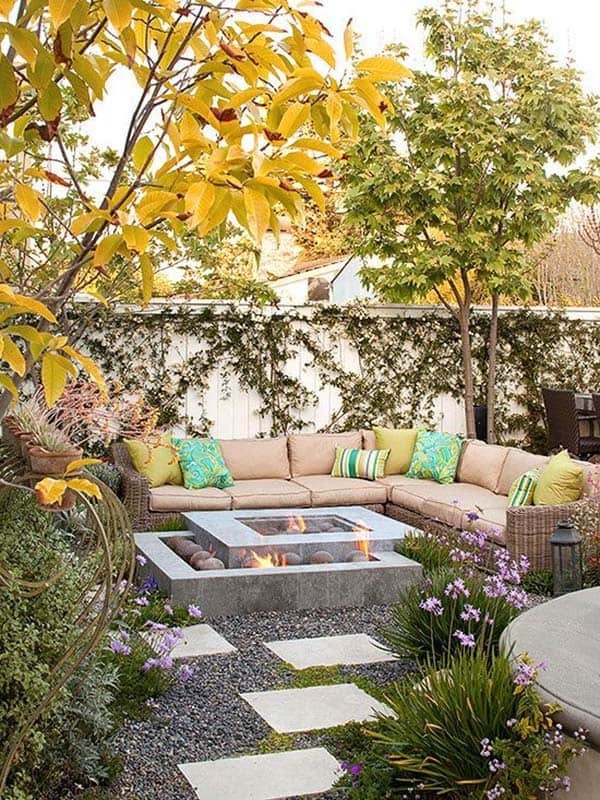 Whether you DIY yours or have a professional come and design one for you, fire pits are a welcoming feature that anyone with an outdoor space can enjoy. 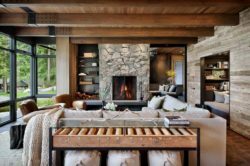 If you love spending time outdoors, this is a great solution so that you no longer have to vacate to the indoors on chilly nights or forgo al fresco dining because you are just too cold. If you decide you want to tackle the responsibility of constructing your own, there are a lot of things to consider. 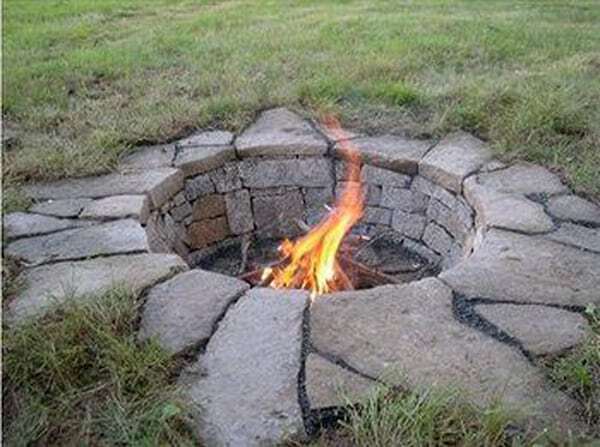 These details include the location of the fire pit, size, how much its going to cost for materials, the type of stone you want to use and a lot of research on how to DIY your fire pit. 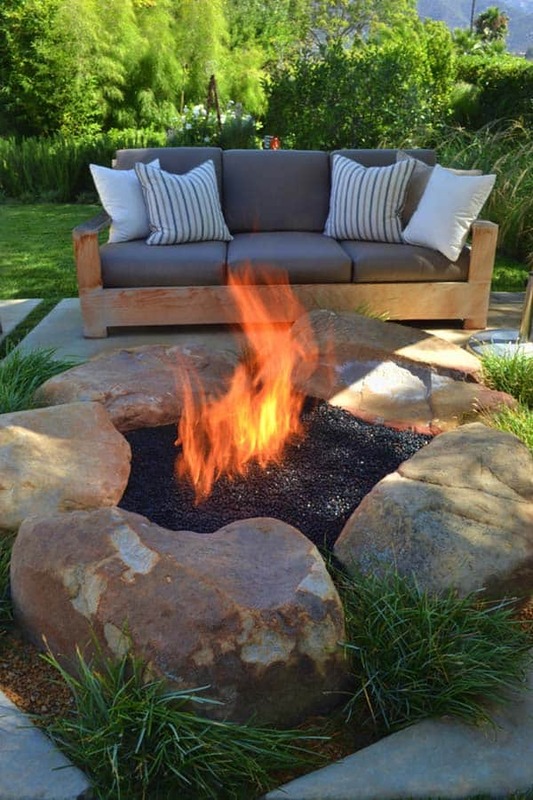 An average cost of a DIY fire pit is anywhere from $100 – $500, and if you go down to image #8, you will see a great example of one that cost $450. 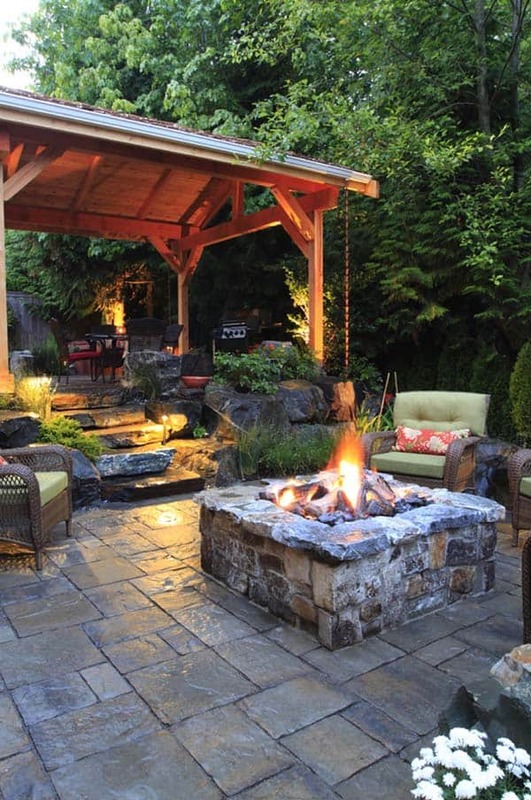 So add some excitement to your deck or backyard with one of these outdoor fire pit ideas that we have collected for you. Enjoy the photo tour, we hope your get inspired! 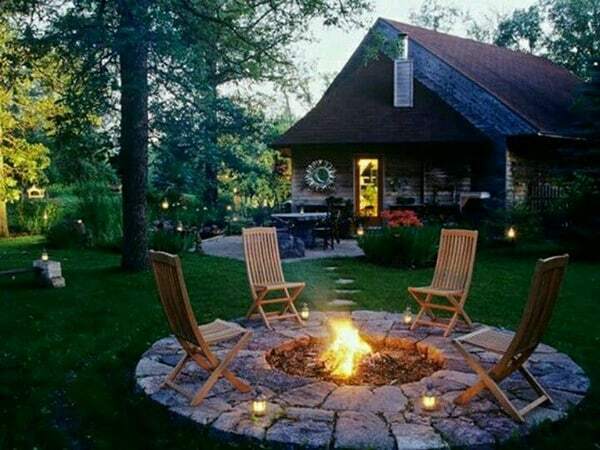 Do you have a backyard fire pit? Share with us which one is your favorite featured here and what you have or would like to have on your own property. 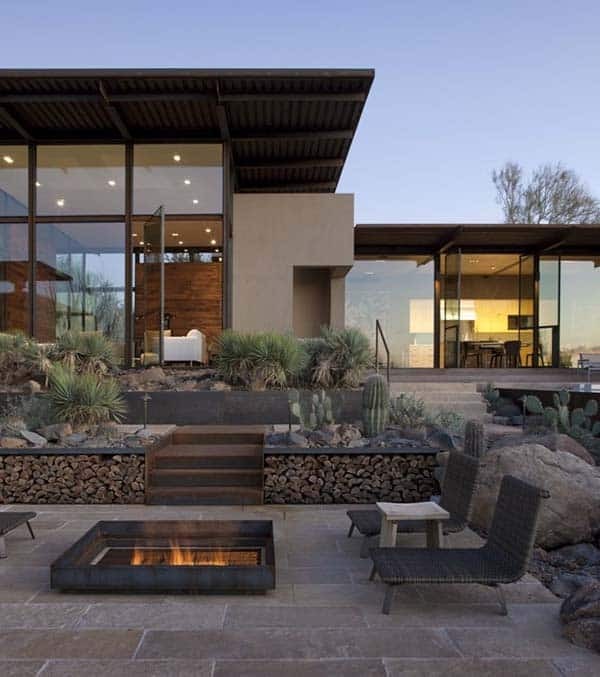 Have a look at some past outdoor inspiration that we have featured here on 1 Kindesign, such as: 53 Most amazing outdoor fireplace designs ever and 52 Spectacular outdoor string lights to illuminate your patio. 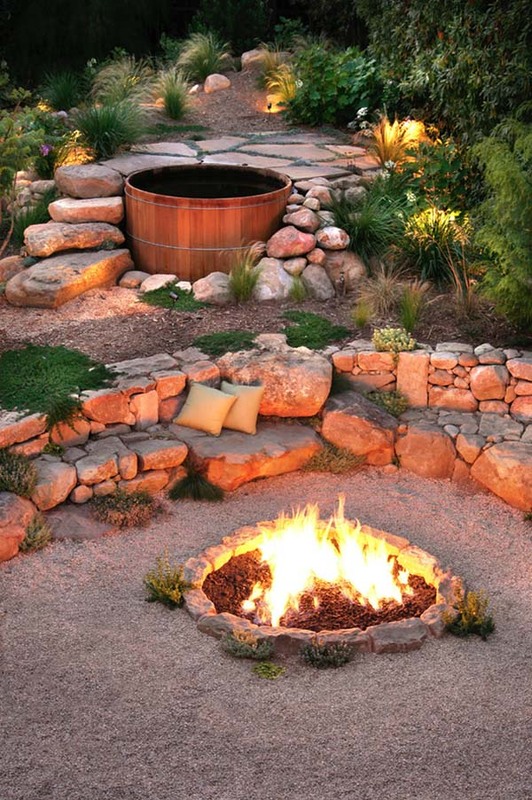 A built-in stone circular bench surrounds a matching stone fire pit. 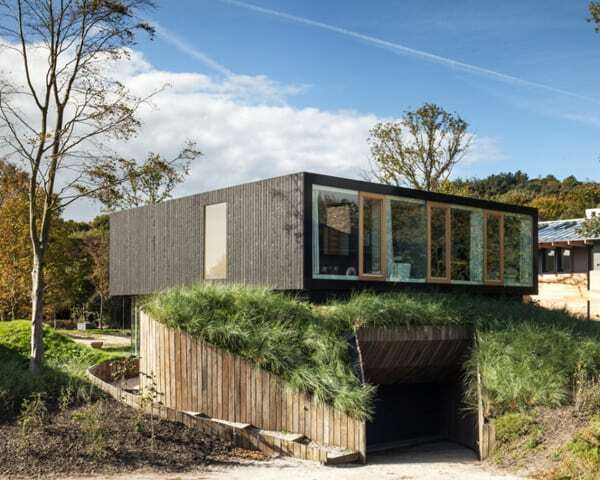 The seating has space underneath for storing firewood. The natural setting and beautiful pond makes this the ultimate backyard escape! 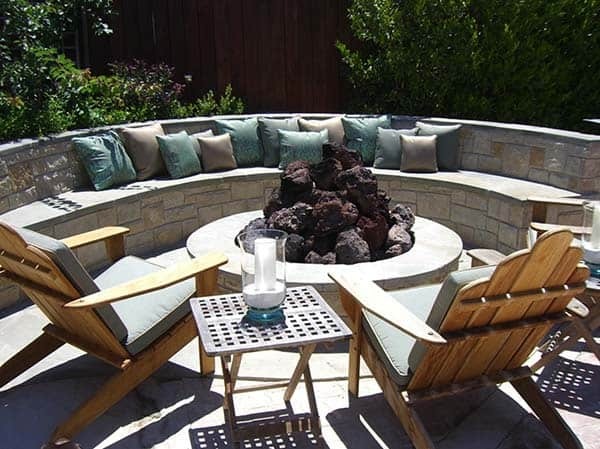 Backyard Fire Pit: The perfect addition to your outdoor living space is a seating wall surrounding a fire pit. 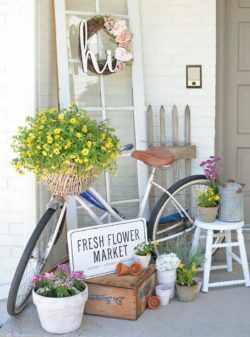 A simple design that can be incorporated into any backyard design, a perfect DIY weekend project! 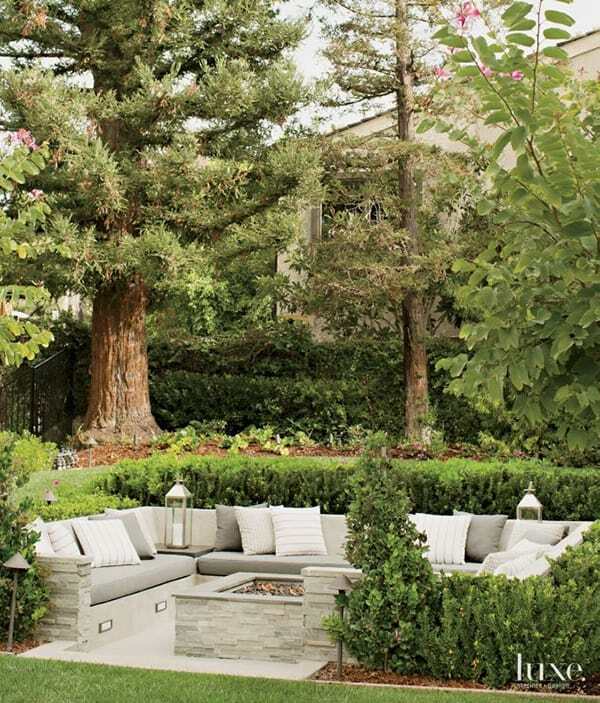 A sunken fire pit with a stone-surround, just add some wood and you have warmth and ambiance. This gas fire pit adds a contemporary aesthetic with eco-glass, made of post-industrial glass melted down and dyed to produce a multitude of colors. 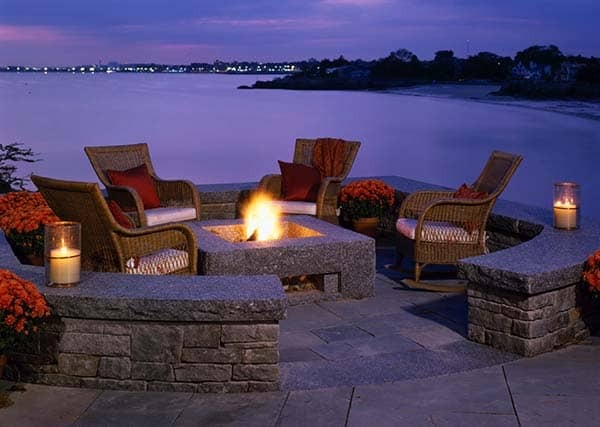 There are many other ideas you can use to top off your fire pit, such as lava rock and treated river stones. 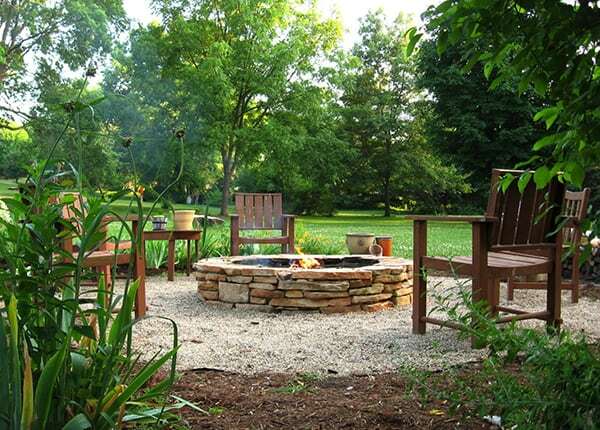 Tip: Do not use untreated stones or materials not approved for use in a fire pit, as they could shatter in the fire. 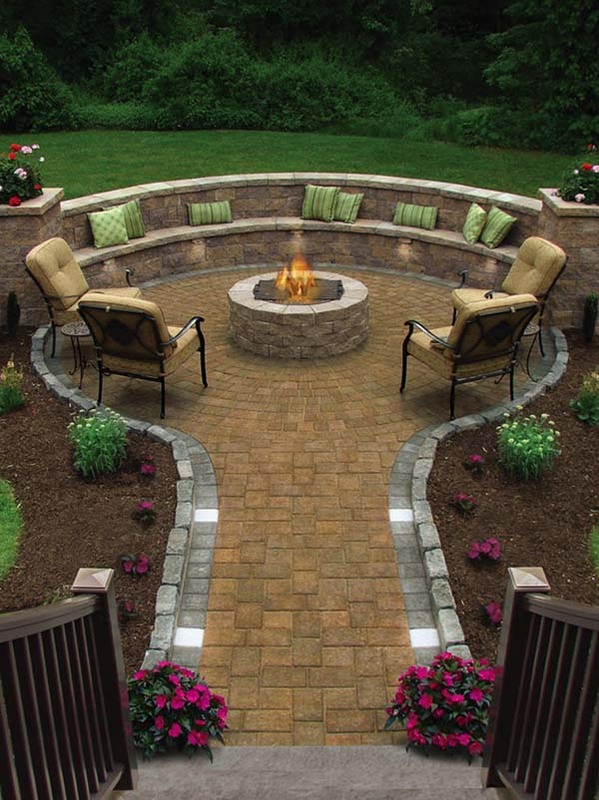 Stacked Stone Fire Pit: This cool backyard deck is perfect for outdoor gatherings with a freestanding fire pit. 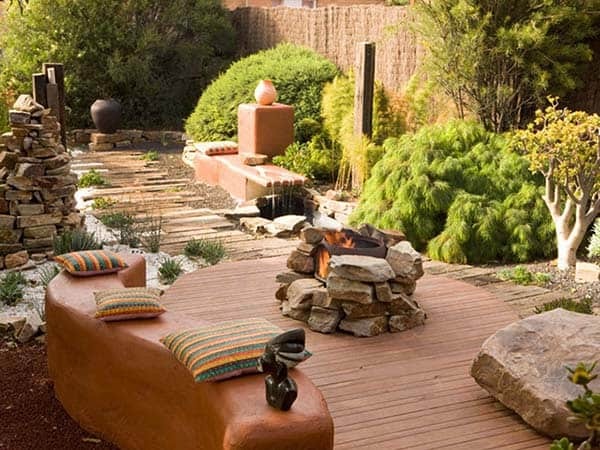 The existing deck incorporates this fire pit by being extended into an organic shape. 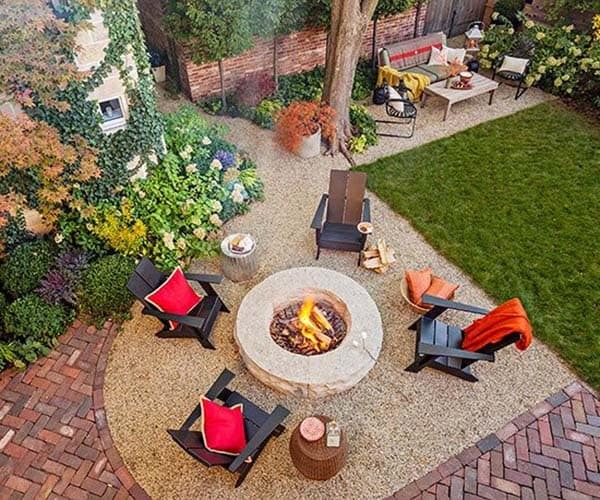 This fire pit measures 5 feet wide by 18 inches tall and is comprised of concrete (4 – 5 bags), mortar (5-6 bags), rebar (10 pieces x 24 inches in length), Sandy creek flagstone and steppers (1,600 pounds) and Fire brick (50 bricks). 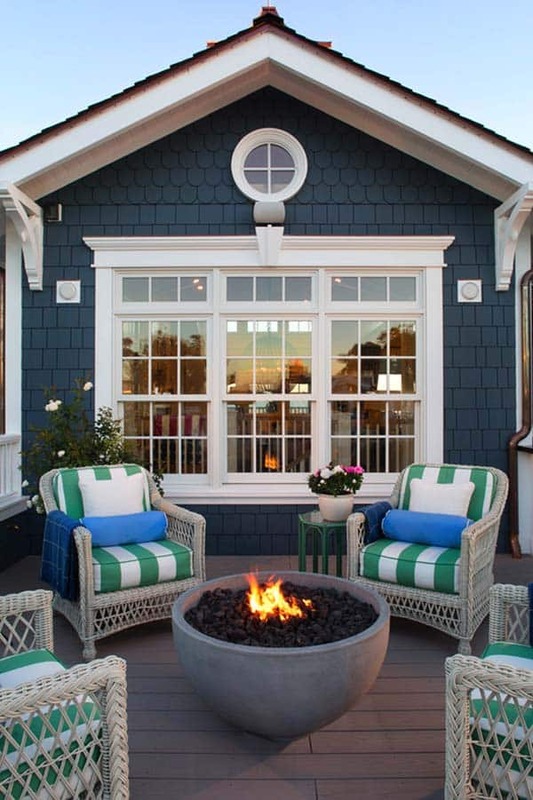 Try adding beach sand to your backyard living space, complete with beach chairs, built-in seating and a fire pit. 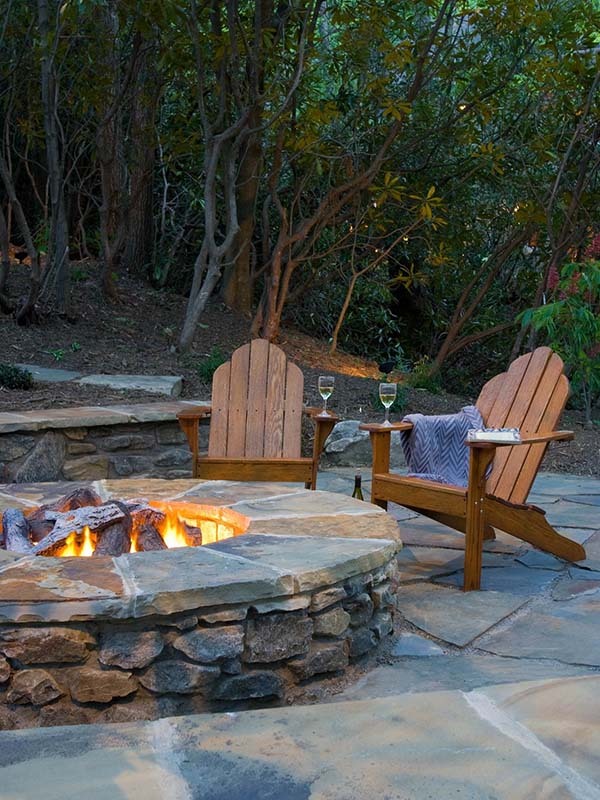 If you have a wood burning fire pit, consider using logs comprised of alternative materials. Today there are logs made of renewable resources that emit 80 percent less emissions than regular fire wood. This means less carbon monoxide emitted into the air and less creosote build-up in your fire pit. There are several options, including logs made from soy, switchgrass, recycled sawdust, used coffee beans and non-petroleum natural wax. 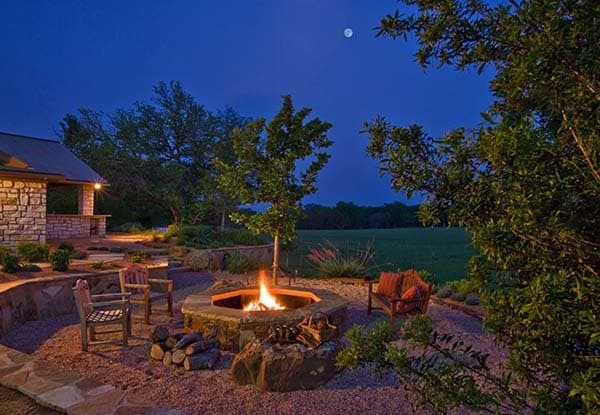 Outdoor Living with a Stone Fire Pit: This private backyard oasis is surrounded by a beautiful forested location. 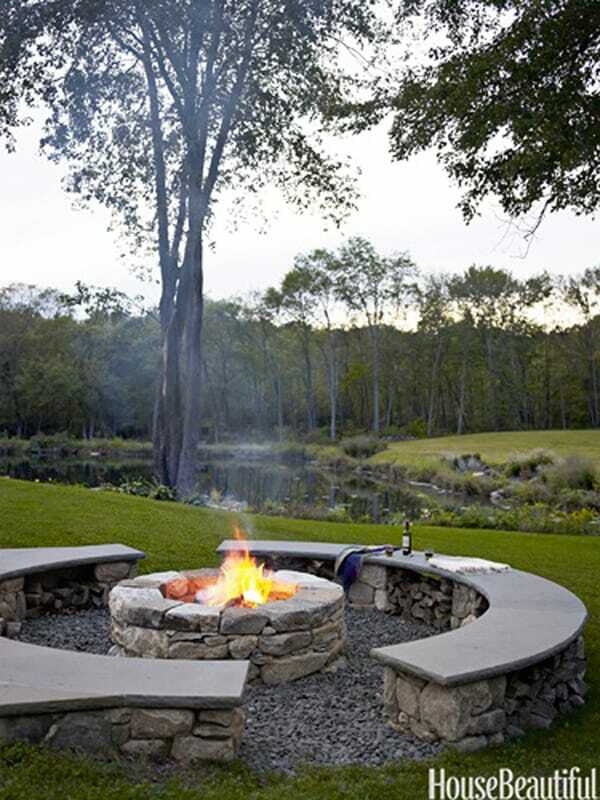 A natural stone fire pit is comprised of a Firebrick interior and is topped with Pennsylvania Bluestone. 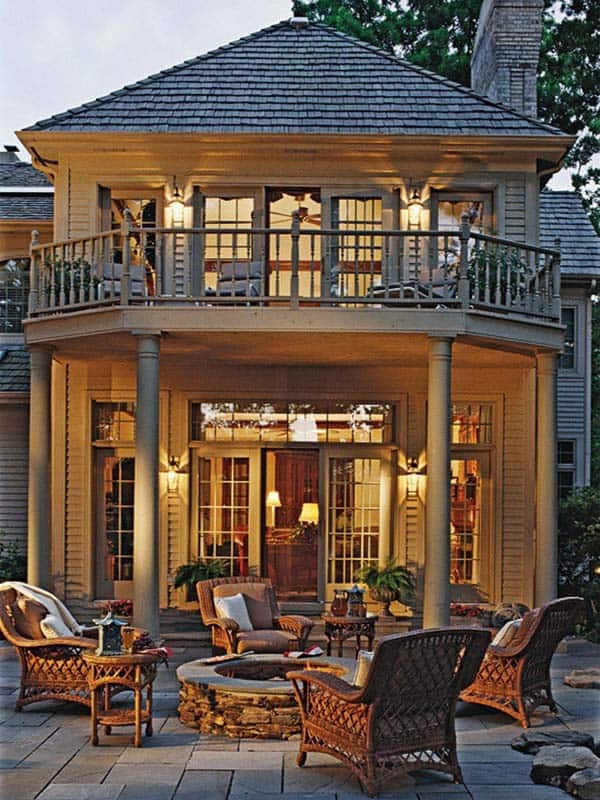 It plays double duty, providing additional seating for outdoor entertaining. 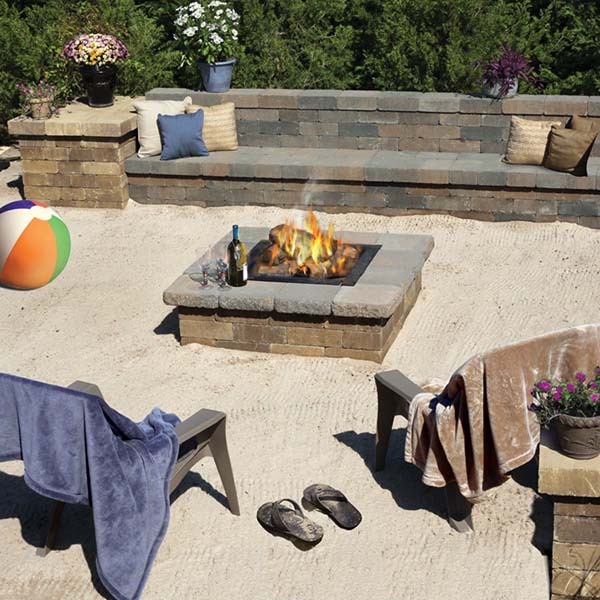 Limestone Fire Pit: This backyard fire pit is veneered with house brick, lined with a fire brick interior and finished with a four-piece thermal bluestone coping. 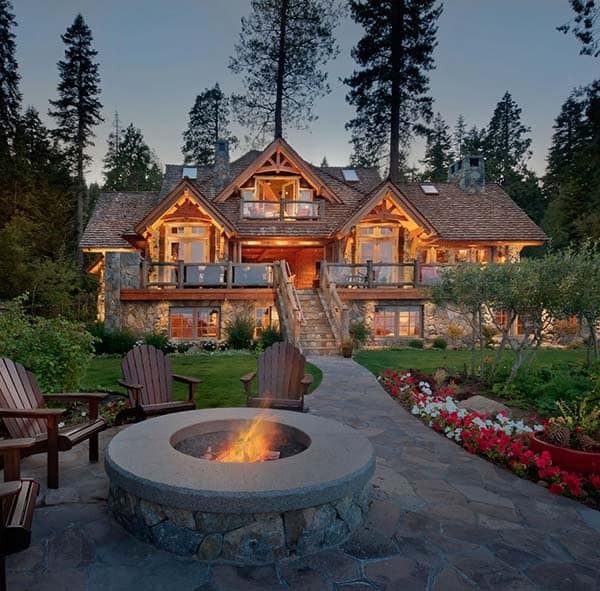 A custom log grate and gas starter is centered in the interior of the fire pit. 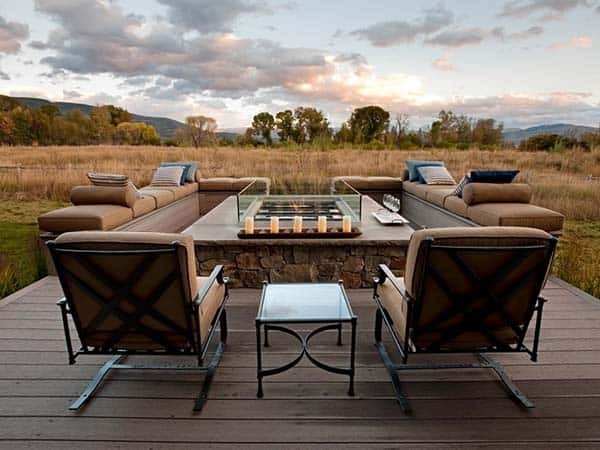 Four-Unit Fire Pit: The outdoor living space of HGTV Dream Home 2012, this modern fire pit features four separate gas units. 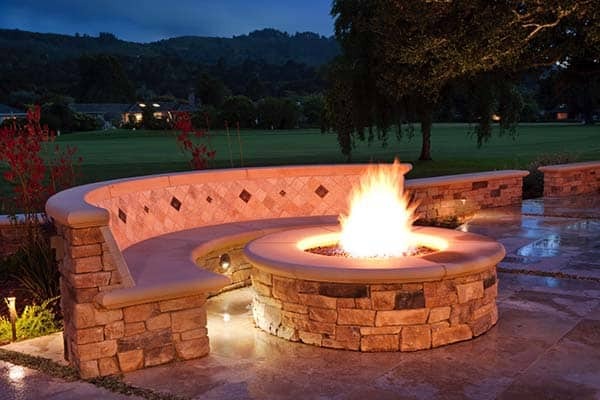 The fire pit itself is clad in Utah limestone with a clear glass surround on top that contains the gas flames while creating a beautiful open fire ambiance. 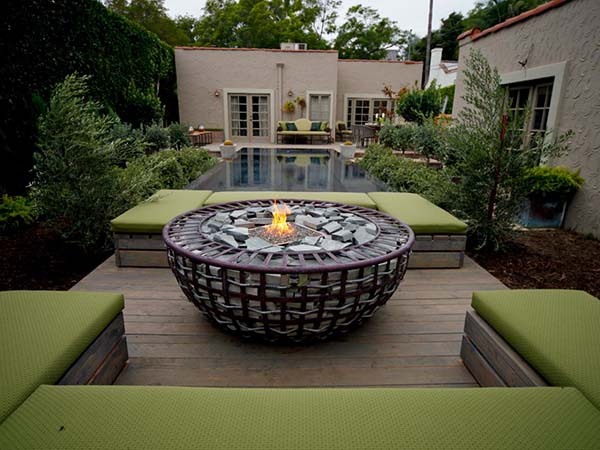 Fire Pit Bowl: A Gabion bowl was used to create this stylish fire pit feature in this modern backyard. The deck for the fire pit is sunk below the height of the infinity pool so that the benches are level to the pool. 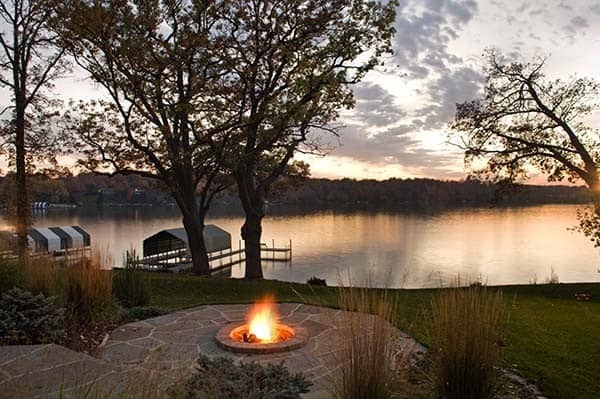 There is nothing more beautiful than a fire pit with a view of water, whether ocean or a lake, it is very peaceful. 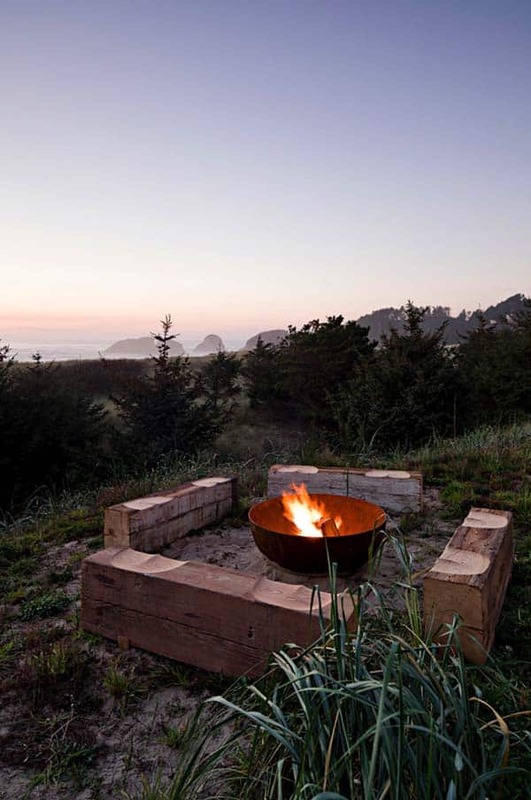 This fire pit is set in a natural surrounding, feeling a lot like camping, except for the burning logs. 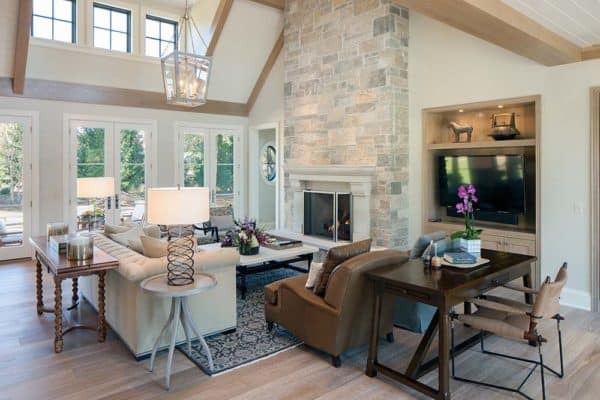 A stone surround keeps the flames at bay. 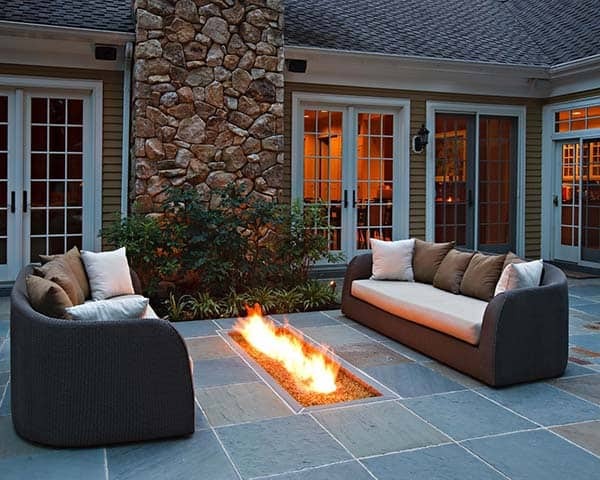 A built-in stone wall and cozy cushions creates lots of seating and lava rock adds a unique textured appeal to the fire pit. 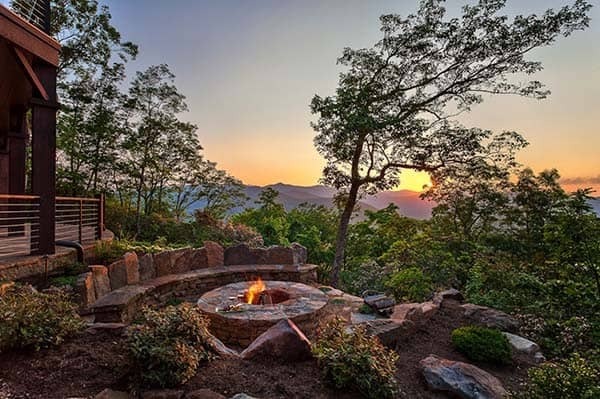 Flat Stone Fire Pit: This outdoor oasis is custom designed with a picnic table, bluestone patio and a fire pit comprised of Pennsylvania flat stone. 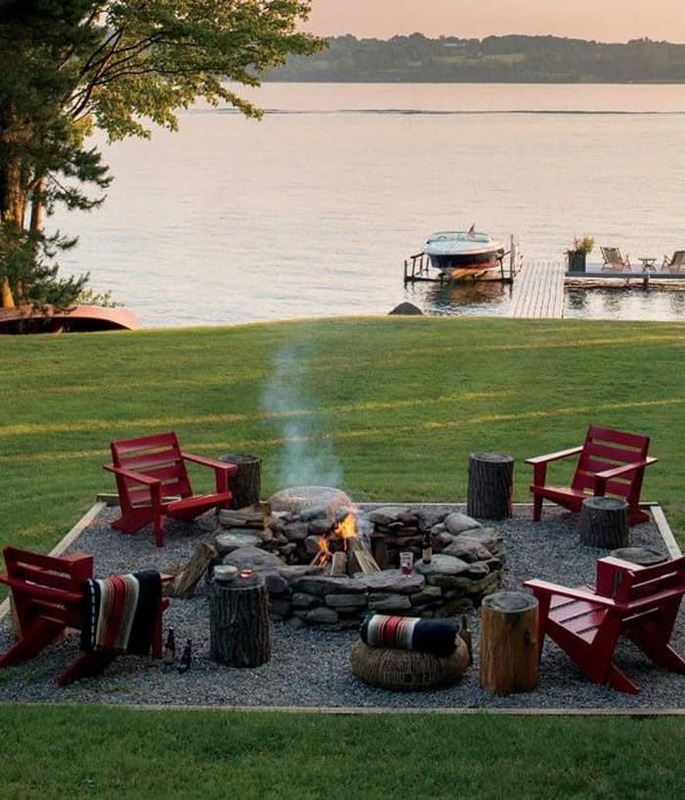 The seating around the fire pit is comprised of upcycled whiskey barrel stools and wooden Adirondack chairs for several seating options. 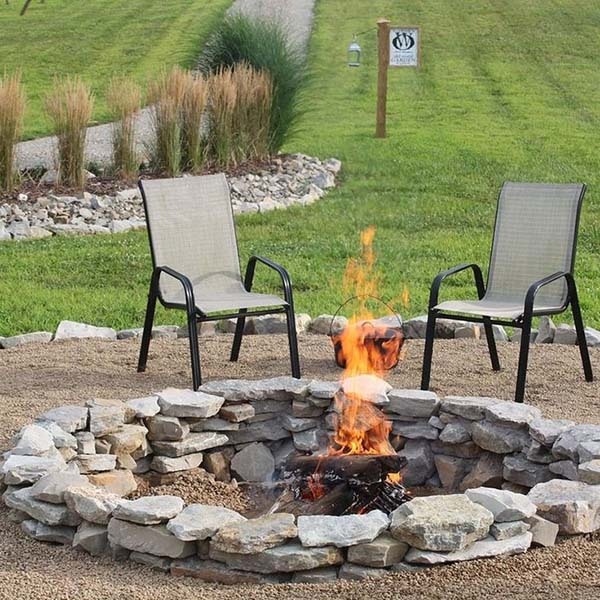 DIY Fire Pit: An outer perimeter of stone, gravel makes up the inner perimeter and the wood burning fire pit is comprised of stacked stone. 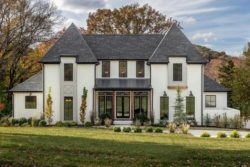 An outdoor space built for entertaining, a fire pit is set into the ground, there is also an outdoor pizza oven to cater to all the visiting children to this beautiful home. 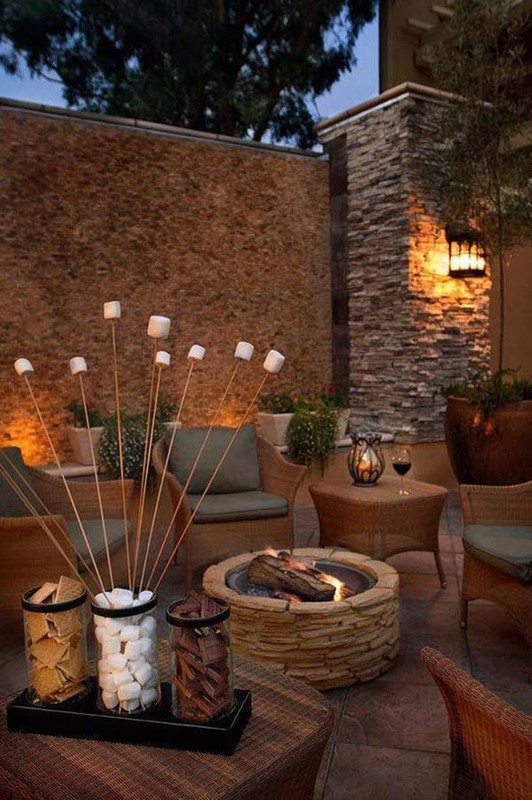 This cozy little fire pit area is the perfect spot for making S’mores and enjoying a glass of wine! Ambient outdoor lighting illuminates the walkway and potted plants. 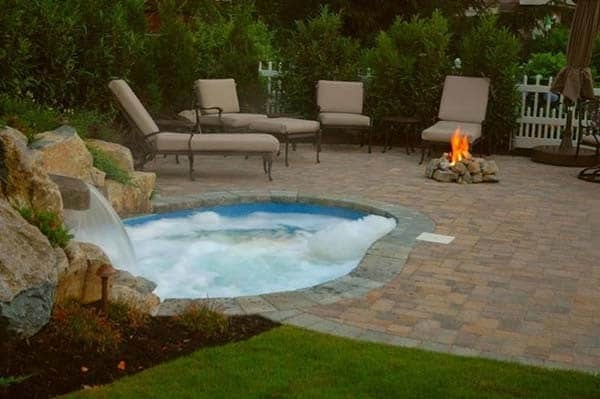 A water feature and a bubbling hot tub is the perfect backyard environment, add a fire pit and some lounge chairs and you have a great setting for entertaining family and friends. 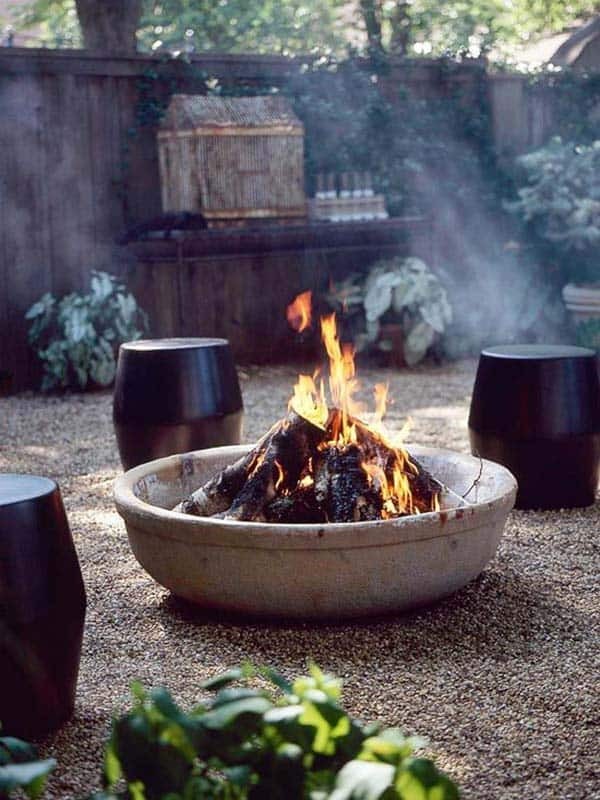 This fire bowl features a natural rustic finish, spun using mild steel like ceramics onto the positive hardwood maple mould. The gas burning fire pit is filled with lava rock. This particular one cost about $ 4,575 to create. 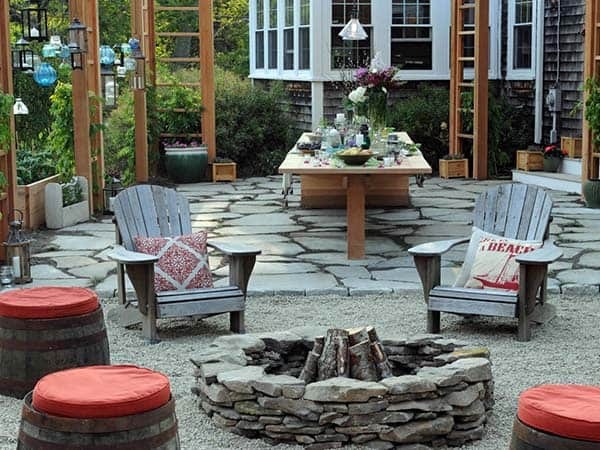 This is a simple DIY backyard space that is cozy and relaxing and spacious enough for family gatherings. 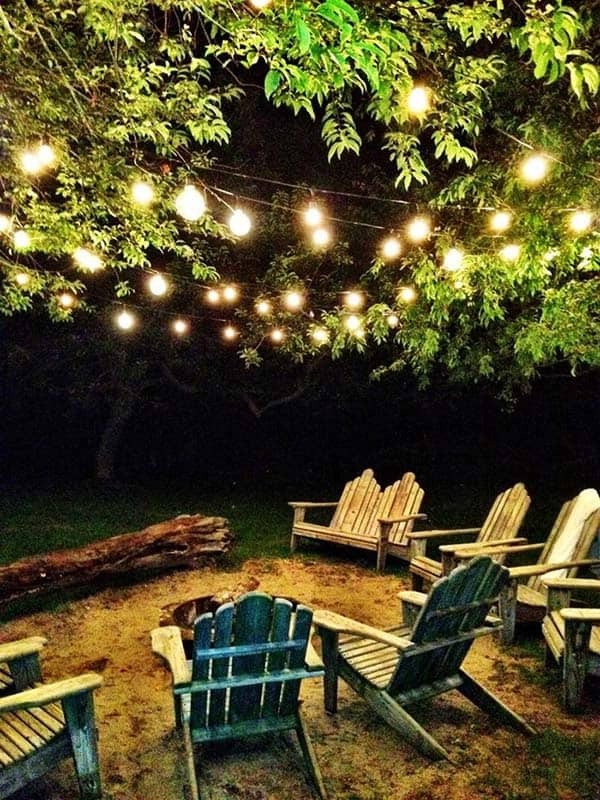 String lights add ambiance to the space, a simple wood burning fire pit glows with warmth and Adirondack chairs completes the look. 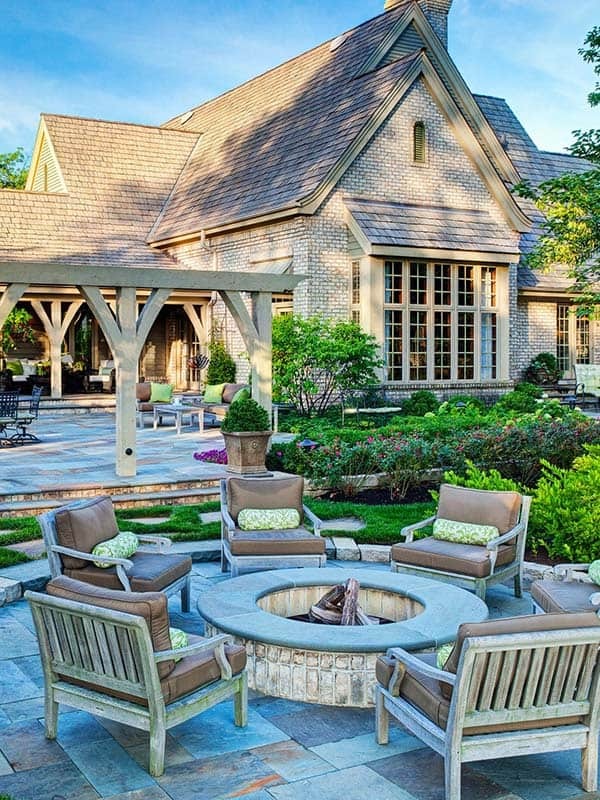 This outdoor living room is an extension of the indoors with comfortable seating and a built-in, stone clad fire pit. 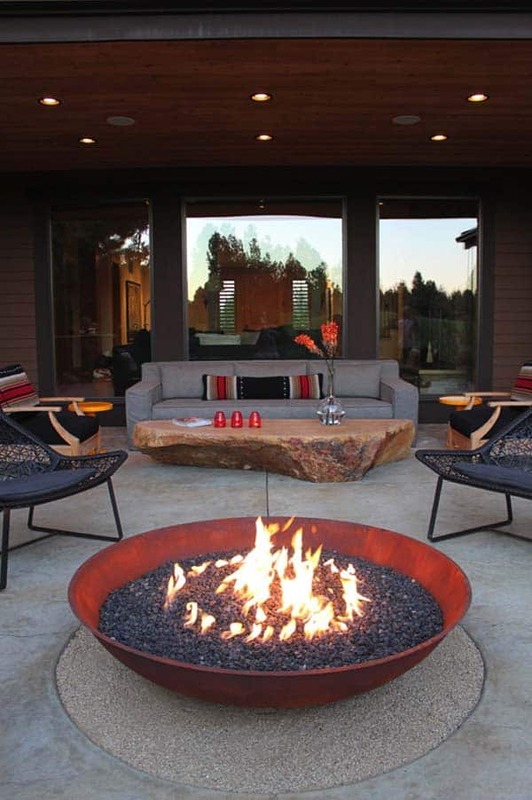 Playful Fire Pit: A modern double fire pit is framed by a long sectional couch. 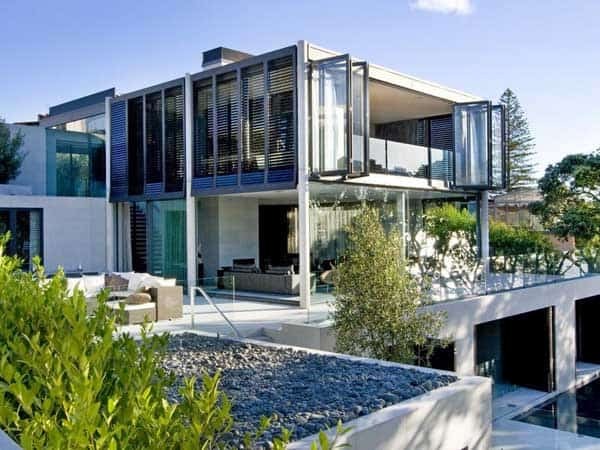 Adding visual interest to the backyard, dark rock and stone tiles decorate the ground. 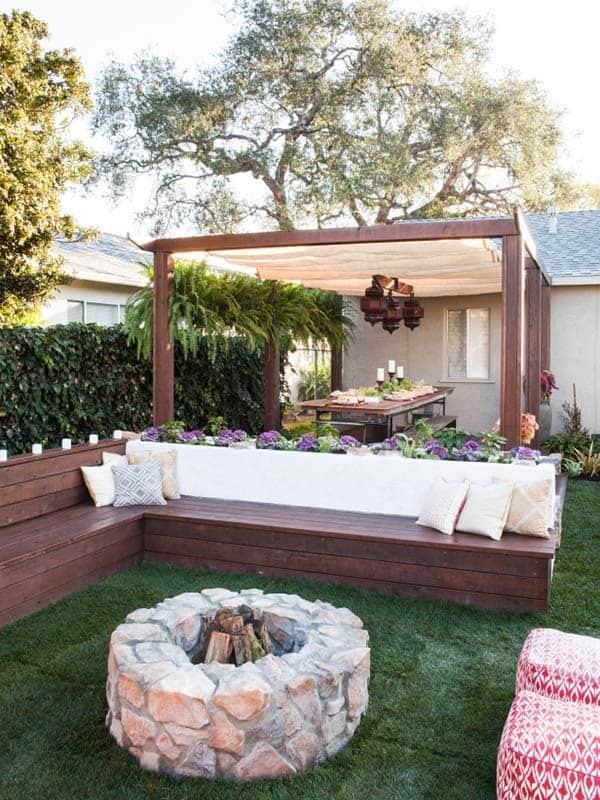 This nice backyard arrangement allows for a perfect outdoor living room for family gatherings during the summer months and crisp fall evenings. 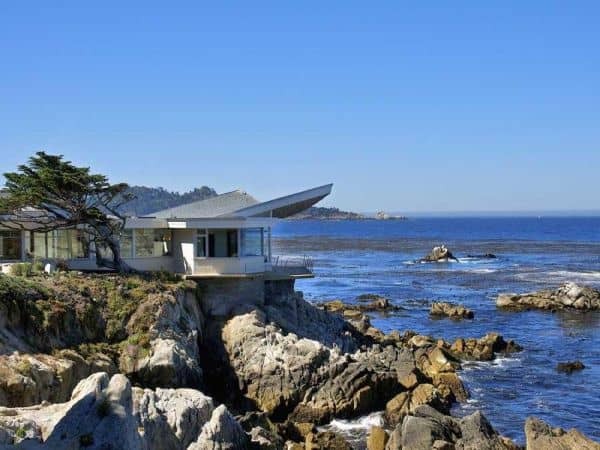 Beachfront Living: The upstairs deck of this home features a fire bowl that perfectly complements the deck and its beautiful surroundings. 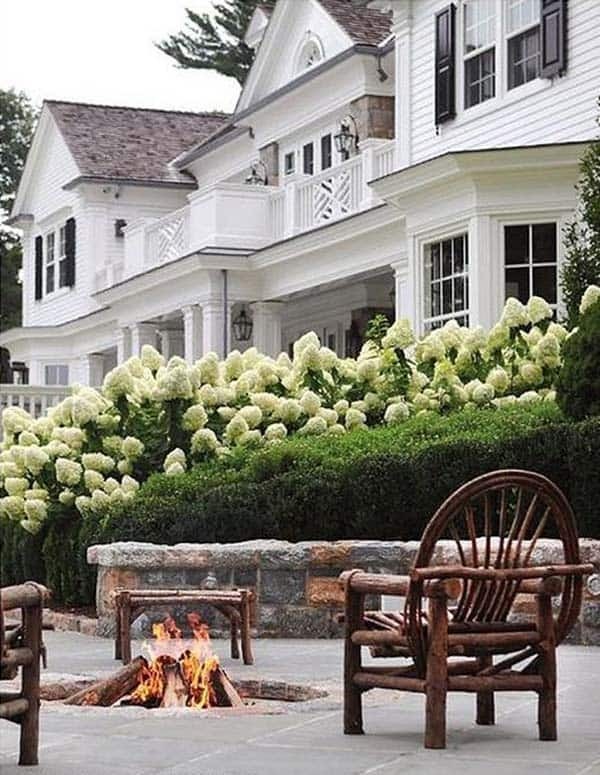 Enjoy the sights and sounds of the waves crashing while being kept warm from the cool ocean breezes from the warmth radiating off this open fire pit.